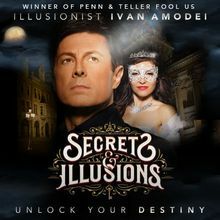 Set on the dark and deserted streets of Paris, you’ll enter the legendary Louvre Museum, where an enchanting musical muse escorts you through galleries, while Ivan uncovers life’s greatest mysteries deep inside the priceless works of art, one dazzling illusion at a time. Watch someone face their greatest fears. Witness a person track down love in the most unexpected place, and another discover how the Laws of Attraction helps them find their purpose in life? Might it be you? 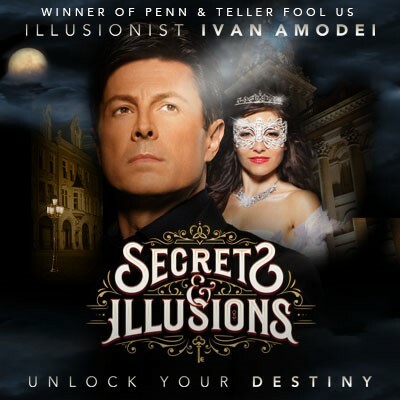 Join master illusionist and Winner of Penn & Teller FOOL US Ivan Amodei on an epic journey to discover the secrets of life in his brand new stage show SECRETS & ILLUSIONS.